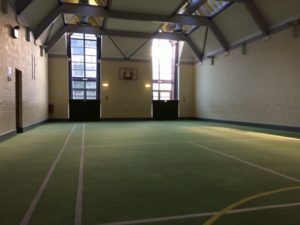 Sports Hall and Coffee Bar Accommodating up to 160 (seated). 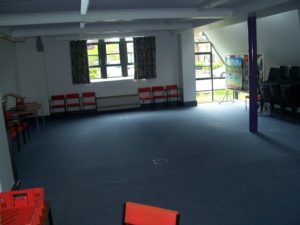 This room is ideal for parties, small sports groups or training events. 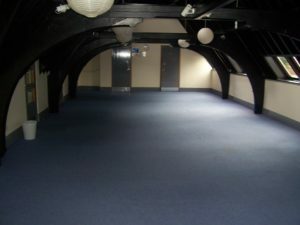 (16.1m x 9.1m – 146.5 m2) The adjacent Coffee Bar may be used for serving refreshments. Rates of Hire During office hours these are charged at £24 for 2-3 hours or £50 for a full day and in the evening or Saturday the costs are £30 for 2-3 hrs or £60 for a full day, For bookings during working hours we can also supply refreshments at 30p per head or provide a Projector, Screen or Flip Chart at £5 each. 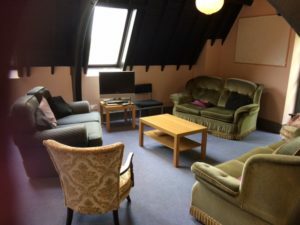 Hirers are welcome to use our kitchen for the preparation of drinks or food but please check with the Church Administrator to ensure there are no other functions taking place at the same time. Booking Conditions and Payment Terms All bookings must be confirmed with the Church Administrator, email parish.office@stjamescarlisle.org.uk and single one-off bookings must be paid in full in advance. Repeat/ongoing bookings can be invoiced monthly if preferred. Contact us for full Terms & Conditions. Any activities involving children must have their own Safeguarding procedures in place or the group leader must undertake to abide by St James Safeguarding Policy. Please call the office and speak to Toby, Church Administrator, if you would like to discuss your requirements. Tel 01228 810616.